Non-rhyming verse about being out of work, the strains that tag along and the sinking boat you feel you're riding in. This collection deals with a difficult subject in a very real way. Its strength is its realness and that is also its greatest weakness. It's not for the faint of heart. 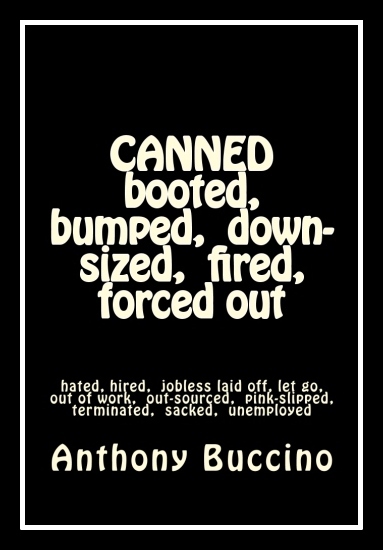 A must-have for anyone who deals in human resources, personnel, recruitment, job placement, or has been fired, laid-off and is out of work. The poems in this book follow a rhythm all their own, charting a course through an unforgiving world. Throughout, the speaker seems to remain buoyant, hopeful in the midst of so many illusions shattering. A poem like "Job Rock" is one of the best here, & most emblematic of the book's concerns. Through a kind of jangly movement, the speaker recounts how many people hope it could be, while flatly affirming that it isn't that way anymore. And despite all of our complaints about bosses & hours, we know he's right - that all we want is a place to belong. Though the book is broken up into sections, the poems don't seem to benefit from this -- either because poems are placed in sections in a manner that can't quite be discerned or because the sections themselves aren't thematically divergent enough. “It is very lively, topical, and to the point. The poems are jazzy, imagistic, and lyrical. This was one of the best books I reviewed for this contest. A well structured book of poetry has the following: clear and compelling cover image that draws the reader in, a table of contents, interesting back material that may included an author’s photograph and biographical note (I found the back a bit cluttered and do consider a photo), and clean typesetting. 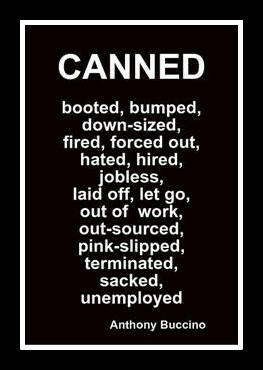 CANNED benefits from most of these. Audience includes the general reader of contemporary poetry and of course anyone suffering from unemployment and layoffs and the general economic crisis. This book speaks to a real problem with humor and poetic technique. “The most professional thing that any book of poetry can have is a list of magazines (print and electronic) where the poems were previously published. This shows seriousness, and a track record. And so the acknowledgements here are a terrific addition. Do consider sending a full manuscript out to some literary presses for consideration. I think this collection is publishable on that level.